Been looking for a tie like this for my boyfriend for ages and finally found the one :) He loves it dearly! 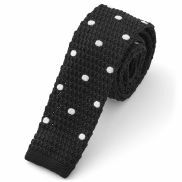 In this category you will find only our narrow ties selection, which are 6 cm wide or less. The dropdown menus help you filter out specific colours, materials and widths. All of our slim ties are in stock. What is the appropriate width for a tie? Is it 2cm, 4cm, 6cm or 8cm? Width was more important in the past, but today personal tastes prevail over fashion trends. Hereunder, please find the assemblage of our narrow ties selection. Similarly to belts for men, ties went through a very narrow swing period getting as thin as 2cm. Today, a wider look is in fashion so that the new "skinny standard" is in between 5 and 7cm. A slim tie width is dictated by what is considered fashionable. These narrow ties are the same width all the way through unlike classic ties that widen at the bottom. Browse through our narrow tie collection to find the perfect patterns and colours for your wardrobe. We offer a 30-day full refund return policy. Subscribe to our newsletter and you will always be up to date on the latest trends and new products. And of course, we encourage you to contact us if you do not see what you want, certainly we can help you out.